His life seemed to resemble that of a typical young adult – spending his early 20’s pursuing a degree in teaching, landing his first job as an English teacher, getting married, and financially helping his family members. Except the year was 2013, and the place was war-torn Afghanistan. 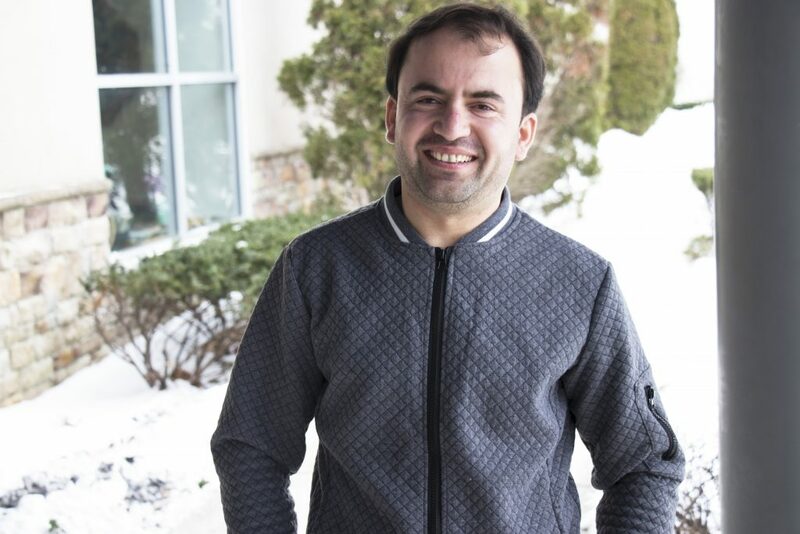 Despite already having a job secured, Abdul Saboor, an Afghani national, made a daring, and ultimately life-changing, decision to utilize his English skills in a new way: serving as an interpreter for the United States military and the Afghani military. The decision did not come without extreme consequences. 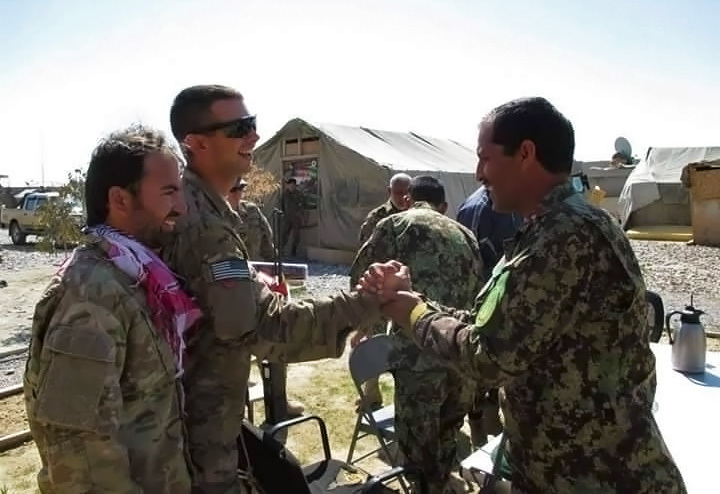 Abdul Saboor (left), an Afghani national and Catholic Charities refugee client, translates for U.S. military (center) and an Afghani soldier (right), during his job as an interpreter in Afghanistan. Despite working secretively, Saboor began finding letters that had been slid under the door of his home – letters promising certain death if he were to continue associating with joint U.S. and Afghani operations. As tensions rose and risk increased, Saboor was granted an SIV (Special Immigration Visa) which allowed him and his wife to seek refuge in the United States. 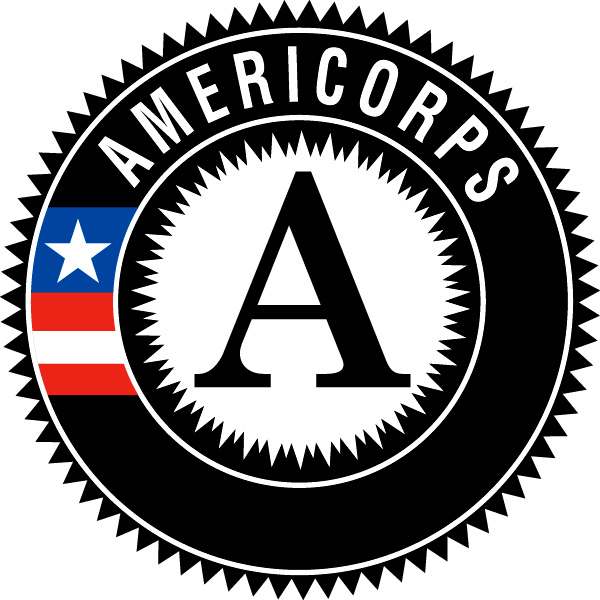 These visas are granted to those who are experiencing ongoing threats as a consequence of providing valuable service to the United States government. He and his wife met with Catholic Charities’ Refugee Resettlement staff at the airport. But, according to his case managers, Saboor did not miss a beat in starting his new life. He immediately found a job, working day and night, until he could afford a used car. After working and saving for several years, receiving a promotion to a managerial position, he eagerly pursued a nursing degree at Camden County College, currently paying the tuition himself. The full-time employee and full-time student explained his passion for nursing. In his already-limited spare time, the 29-year-old volunteers to assist Catholic Charities with a wide variety of tasks – whether it be helping with translations, accompanying clients to doctors’ appointments, or offering rides to clients who need assistance with transportation. Saboor reflected on the opportunities that this country brought him. National Migration Week provides an opportunity for the Church to reflect on the circumstances confronting migrants, including immigrants, refugees, children, and victims and survivors of human trafficking. As noted by the United States Conference of Catholic Bishops, the Church supports the human rights of all people and offers them pastoral care, education, and social services, no matter what the circumstances of entry into this country, and it works for the respect of the human dignity of all, especially those who find themselves in desperate circumstances. As Catholics, we are called to welcome these newcomers with heartfelt hospitality, openness, and eagerness both to help and to learn from our brothers and sisters of whatever religion, ethnicity, or background.